Today, 25 April, marks the 102nd anniversary since the first Anzac Day. Originally created to honour the members of the Australian and New Zealand Army Corps (ANZAC) who landed at Anzac Cove as part of the Gallipoli Camapign during World War I, it is now observed each year to honour Australian and New Zealand troops who have served and died in all wars, conflicts, and peacekeeping operations. 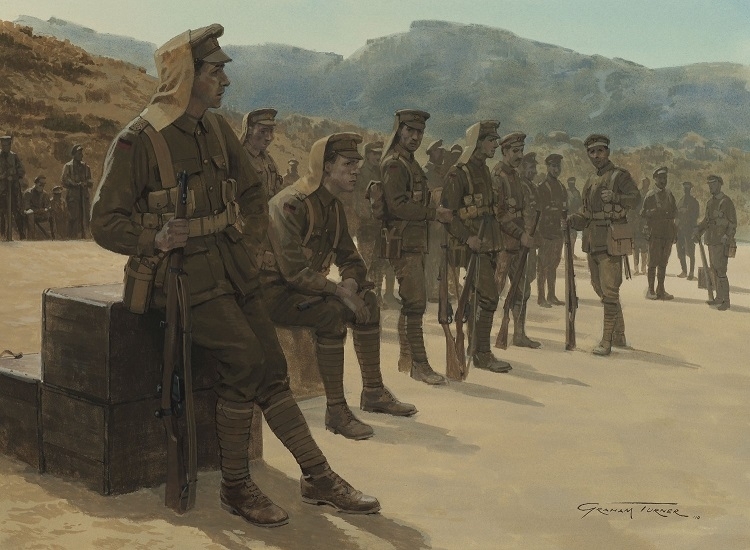 Today we look back at the events of 1915, which inspired Anzac Day the following year. Below is an extract from Warrior 155: Anzac Infantryman 1914-15 by Ian Sumner, which looks at the Anzacs landing. 'As they drew closer to the enemy shore early in the morning of 25 April, some of the men in the boats were struck by the stillness of the scene. Lieutenant Ivor Margetts, a Tasmanian serving with 12th Battalion, recalled: ‘I am quite sure few of us realized that at last we were actually bound for our baptism of fire for it seemed as though we were just out on one of our night manoeuvres in Mudros harbour, but very soon we realized it was neither a surprise party nor a moonlight picnic.’ For others the predominant memory of the 40-minute trip from the transports to the landing beach was how long it seemed: ‘like days’ for Sergeant Henry Cheney (10th Battalion) and ‘to go on for ever’ for Lieutenant Aubrey Darnell (11th Battalion). I was in the second tow, and we got it, shrapnel and rifle fire bad. We lost three on the destroyer and four in the boat getting to land. The Turks were close on the beach when we got there. We had to fix bayonets and charge. We jumped into the water up to our waists and some … their armpits … we had to trust to the penknife at the end of our rifles. When I got there it was not too long, but … I tell you you do not forget these things … all we thought of was to get at them. One would hear someone say ‘They’ve got me’ and register another notch when you get to them, that’s all. The Anzacs landed in 12 ‘tows’. Consisting of a picket boat, a steam launch or pinnace, a cutter and a lifeboat, each tow was capable of carrying 120–60 men. The steam launch brought them as close as possible to the shore, and then cutters rowed them to the beach. Hamilton had requested more boats, but in vain. He could land only two divisions at a time, the boats then returning to the transports to collect the follow-up waves. The brigades and battalions of the assault force had rehearsed the landing on the nearby Aegean island of Lemnos from 15 to 18 April. There they were told: ‘no rifle fire is to be employed until broad daylight. The bayonet only is to be used. No bugle calls are to be sounded after leaving Lemnos. No bugle calls are to be sounded during the charge.’ But, under the circumstances, this was a counsel of perfection. Of all the battalions in the assault force, the men of 11th Battalion appear to have met the heaviest fire as they approached the beach, and they were ‘shouting and hurraying and calling the Turks all the rude names they could think of’. We'd like to wish all our customers from Australia and New Zealand commemorating Anzac Day, a reflective and peaceful day. We will remember them. My dad is currently recovering from a heart attack in harefield hospital. The hospital has a Anzac ward as there are Anzac war graves at the village. There are a series of banners in the village comerating Anzac day. For those who haven't read it, I recommend The Anzac Book, written and illustrated by the men at Anzac Cove.